Walked into Radisson Blu Plaza for lunch last weekend. Holy Basil, one of their main restaurants across the lobby serves authentic Chinese, Thai and Japanese dishes. 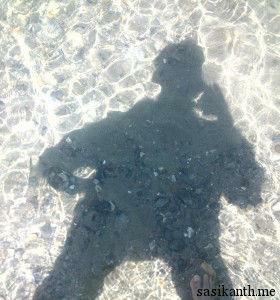 The place is brightly lit, and I made myself comfortable in the center of the restaurant. Most of the food on their menu looked pretty tempting. Wanting to try a bit of everything, I ordered Veg Sushi and Kung Pao Mushroom for starters. The Sushi was served in about 10 minutes, and looked very good. 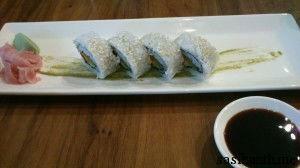 I’ve had Sushi only at Urban Asian before and was expecting similar kinda taste but these turned out to be different. These were kinda sticky, and pretty much bland. I spoke to the chef about the taste, and he told me they were supposed to taste like that. However, I liked the Urban Asia ones better. I’ve heard people talking about Kung Pao Chicken, so was really looking forward to tasting the mushrooms. And they turned out to be awesome. 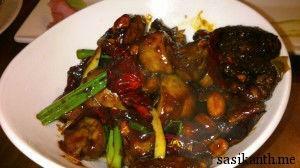 A mix of button and shiitake mushrooms in spicy kung pao sauce, they were absolutely yummy. No wonder people go gaga over the chicken dish. 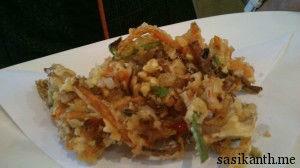 I also tasted a portion of Veg Tempura, which was very crunchy and had a very nice flavor to it. For the main course, I asked the Japanese chef to recommend something special, and he suggested I try some Noodles, with Sauteed Tofu and Mushrooms. The food was cooked at the open kitchen near the table and served in a matter of minutes. 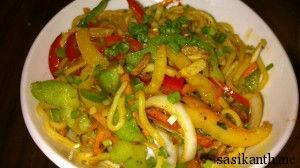 The Noodles came with lots of crunchy vegetables, and was spicy and tangy, different from the regular Chinese noodles. 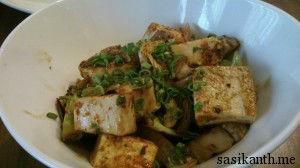 The Tofu and Mushrooms had a nice flavor to them and tasted pretty decent. While I lived in the US, I used to hog on Basil Fried rice at a small Thai restaurant at Plattsburgh, NY, which tasted amazingly delicious. Ever since I came back to India, I’ve been trying to find something similar. I asked the Thai chef if she could make any thing similar, and she kindly obliged. The outcome was better than the one I remember having in the US. Spicy, with nice basil flavor, it was simply delicious. For dessert, I was tempted to try their Chilled Mango Pudding with Fresh Cream and Ice-cream., but zeroed on Chocolate Spring Roll. 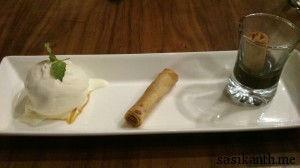 Two tiny spring rolls stuffed with chocolate were served with chocolate sauce and vanilla ice-cream. The combination was absolutely toothsome. Overall, it was a delicious meal. 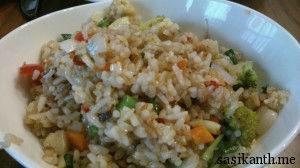 I loved their Kung Pao Mushroom and the Basil Fried Rice. The service was pretty good as well. All the dishes are priced on the higher side, so if you can afford, go give this place a try. I’m guessing you wont be disappointed!! what abt the pricing? u didnt mention it!! !